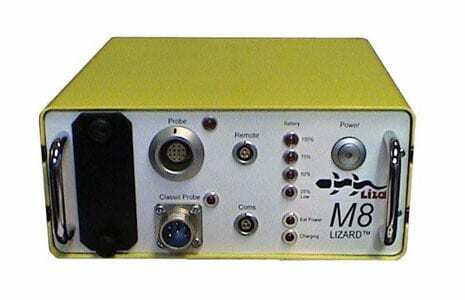 The Lizard M8 ACFM Flaw Detector is a lightweight user-friendly tool for field work or laboratory applications. 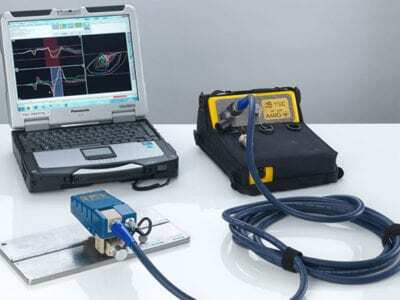 This robust system offers uncompromising performance for eddy current inspections, as well as field gradient imaging and other modes of measurement. The Lizard M8 is fast, accurate and easy to use. Quality assurance and high validity of the inspection data is ensured by the functionality checks stored within the system flaw detector. The comprehensive Lizard LISS software aids inspection analysis using corrosion mapping and defect imaging. Instrument display modes are available for existing probes to provide a familiar layout environment. Extend capabilities for restricted access and subsea operations using optional equipment. Multi-frequency system compliant with EN1711 inspection. Lizard® Eddy Current, AC Field Measurement, EMA and FGI simultaneous acquisition and display. Fast digital sampling for rapid inspection rates. Software selectable filters for scan noise reduction. Signal Alarms, fully software configurable for defect depth and probe coupling/contact limit. Full inspection traceability with full inspection data storage and retrieval. Conductivity measurement (%IACS) and metal sorting capability.